A hernia appears when an internal organ protrudes through a wall of tissue (often a muscle) into another area of the body where it does not belong. 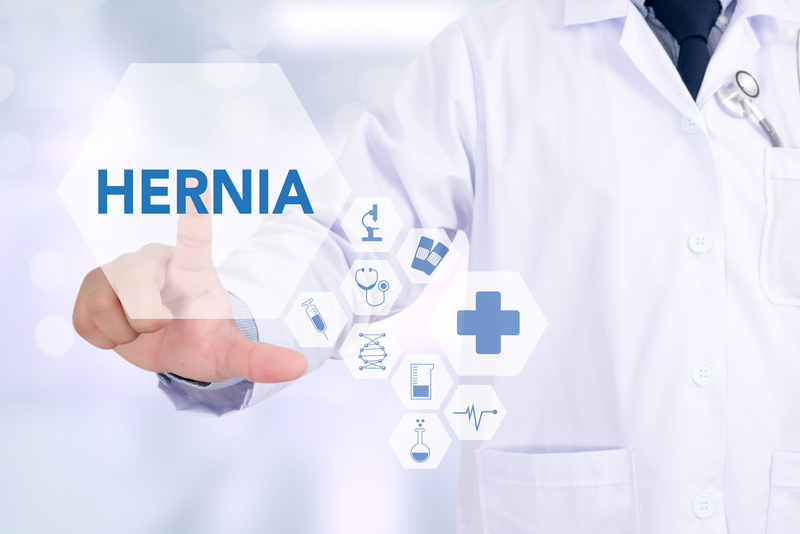 Depending on how bad the hernia is, surgery may be required to fix it. Because hernias involve a hole in a muscle or other tissue, additional reinforcement is thought to be needed to close the opening and keep it from reopening. This is where hernia mesh comes in. The mesh often takes the form of a plug or sheet of biological or synthetic mesh and is surgically implanted over the hole. But not all hernia mesh is effective. And some don’t work. Physiomesh is a multi-layer mesh with layers of polypropylene and film. Ethicon hoped that the film layers would resist adhesions (scarring), permit mesh ingrowth into the abdominal wall, and maintain separation between the mesh and internal organs. Physiomesh is a product intended to be used in laparoscopic surgeries. This is the less-invasive surgical technique using fiber-optic instruments and tubes. 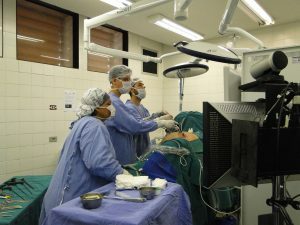 A laparoscopic surgical procedure is illustrated in the photograph to the left. In hernia repair operations, the tubes enter the abdominal wall and, using small cameras and other medical instruments, the surgeon is able to repair the hernia surgically, including in some cases implanting hernia mesh. Obviously laparoscopic procedures are less traumatic to the patient and easier from which to recover. That is, if the implanted devices are not defective. Unfortunately, Physiomesh has been shown to cause scarring around the mesh, inflammation, implant folding and curling, and other serious complications. Physiomesh causes adhesions but does not permit adequate ingrowth into the abdominal wall. Sadly, these results would have been available to Ethicon if it had done adequate premarket testing on the Physiomesh instead of rushing it to the market. In April 2010 Physiomesh was approved to treat hernias in patients. It was approved by the FDA through the 510(k) process, which I have written about often on this site. The 510(k) process is a way around the more complex (and safer) premarket approval process. Under 510(k), the manufacturer notifies the FDA of its intent to market a device like hernia mesh and explains the device’s “substantial equivalence” to a device already on the market. The FDA may then approve the medical device for sale in the United States without extensive premarket testing. This is how Physiomesh made it to the market, in October 2010. Physiomesh was on the market from October 2010 until the product was withdrawn in May 2016. This means that if you had surgery for hernia mesh repair between October 2010 and May 2016, and mesh was implanted, it could possibly be Ethicon’s Physiomesh. Want to Learn More About Physiomesh? There are other studies out there, and plenty of other information on Physiomesh and the problems it has caused. One estimate indicates that as many as 160,000 patients received the Physiomesh hernia mesh in the United States between October 2010 and May 2016. It is expected that hundreds of people will eventually file suit against Ethicon for injuries caused by Physiomesh. On May 25, 2017, the Judicial Panel on Multidistrict Litigation (JPML) conducted a hearing on a motion brought by Physiomesh plaintiffs, who asked the JPML to create a new multidistrict litigation specifically for Physiomesh cases. I will let you know when a decision has been reached on that motion, though I suspect we will see a Physiomesh MDL. In the meantime, if you have had any surgical mesh implanted in your body to treat a hernia, and particularly if you know you received a Physiomesh hernia repair product, you should speak with your doctor as soon as possible. This is important, even if you aren’t aware of any problems with the mesh. You may be fine, but you should monitor your situation carefully.